You may already know that I love all things Chanel, so this time I created nail art inspired by my favorite fashion house. Simple in classic black and white with a signature logo, this type of manicure is perfect for a night out or any other dress up occasion. Imagine a white shift dress, black opaque stockings, a long string of pearls and a glass of champagne in your hand… mmm…. Of course, as with all of my other DIY nail art, this Chanel inspired manicure is really easy to recreate. Enjoy! 1. Apply two coat of opaque black nail polish on each nail except for your ring finger. Then two coats of white nail polish on your ring finger. I used Revlon 050 White on White and Blackest Black nail polishes. 2. 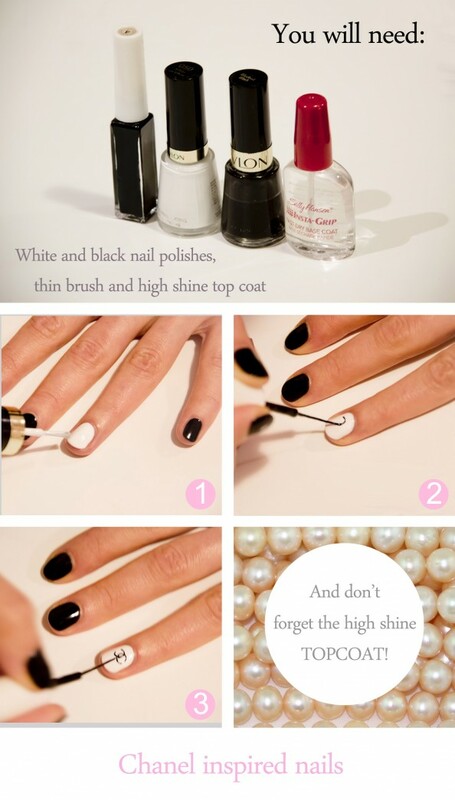 Draw a C shape with a black nail polish with a thin brush over the white nail polish on your ring finger. 3. Draw the second part of the logo – a mirrored C shape over the C shape you just drew. Let it dry and apply the topcoat for extra shine. I have been following your blog for around 11 months and this is my first comment. All the best and keep it up dear. Thank you for your kind words. It is comments like that that keep me going with blogging! I really appreciate your comment and your 11 months of support of the blog. Love this look, thank you for sharing the tutorial! Awesome!! I’m not sure my pulse is as good as yours but i’ll definitely try it out!! Thanks for sharing! !